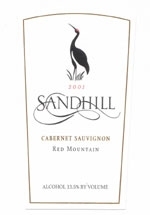 We’ve been one of the top sellers and biggest fans of the Sandhill Cabernet Sauvignons since we opened in 2002 and started selling the 1999 vintage of this Washington success story. That 1999 won a Top 100 award from Wine Enthusiast in 2003, and winery owner John Dingethal finally surpassed the quality of that wine with the 2004…the last vintage completely under his control before selling the winery in 2008. John believed no bottle of wine should cost over $25. Even after winning a Top 100 award his wine sold for just $19.99! His 2004 is now just $21.99, and boasts the full body, depth and structure of many $40 bottles. Bold dark fruit, a smooth balance of fine tannins in the background, with age-worthy qualities that will make this wine age gracefully for several years. Flavors of cola, cherry, coffee and hints of cocoa flood the palate. 25% Merlot in the blend adds to the complexity and depth. Drink it now as your every-day Cabernet and you’ll derive the most pleasure, knowing that you can still obtain a few more bottles. The wine is crafted from fruit grown on the original/first Red Mountain Vineyards to the east of Yakima, across the street from the very recognized Hedges Cellars. Red Mountain is the state’s smallest winemaking AVA, (downright tiny at about 4000 acres!) argueably producing the best red grapes grown in the Northwest. On the 2003 Top 100 list of Wine Enthusiast, 5 of the wines considered the best of the year (of the entire world’s wines) were created from Red Mountain grapes! Robert Parker continues to be a growing fan of the wines produced here. The Sandhill Cabernet is a relatively hidden find…it was only sold in a few states due to its limited production and the fact that John himself distributed most of the product by driving it around Washington himself! Now the new owner has signed up with distributors, but the market hasn’t discovered this gem quite yet. Don’t miss the opportunity to snap up cases of this wine now.